From archaeological and fire research to experimental ecological restoration, the Amah Mutsun Land Trust is using science to help bring indigenous stewardship back to the lands of the Amah Mutsun. Through a range of projects spread throughout the Tribe’s ancestral territory, we have forged valued partnerships with conservation organizations, land managers, and research institutions to shed light on the historical conditions of the California landscape and to better understand how cultural and biological resources can be best enhanced and protected today. The diversity of our work testifies to the breadth and importance of indigenous ecological knowledge. Learn more about our current projects below. AMLT is working with Sempervirens Fund to steward and conduct research at a small meadow (ca. 1.5 acres) surrounded by mature mixed forest. The meadow is a former Christmas tree farm that contains a high density and diversity of native and ethnobotanically significant plants. The purpose of this project is to understand the effects of different stewardship methods (burning, shading, weeding, mowing) on native and exotic vegetation. Additionally, the Native Stewards will be removing invasive species from the meadow. Quiroste Valley Cultural Preserve is a 225-acre portion of Año Nuevo State Park where the California Department of Parks and Recreation is working collaboratively with AMLT to protect and steward cultural and natural resources. The preserve was created in 2008 due to the presence of significant archaeological, historical, and ethnobiological resources in the valley. Since 2007, AMLT has been working with a multidisciplinary team of scientists to research the relationships between Native people and the Quiroste Valley landscape over the long term. The research suggests that Native people maintained open coastal prairies in this area through frequent landscape burning. Today, most of the landscape has transitioned to shrublands and conifer forest due to lack of active management. Beginning in 2015, AMLT has been working to preserve and expand coastal prairies, as well as to remove selected invasive exotic plants like poison hemlock. The Amah Mutsun Tribal Band has a Memorandum of Understanding that formalizes the importance of cooperating with the Amah Mutsun on matters of cultural resource stewardship within the National park boundaries. The park and the tribe have a productive history of cooperative research and restoration of culturally significant species, particularly basket-weaving plants and edible grassland plants. In 2011 project partners implemented an experimental burn in a native deergrass meadow that was the first burn to improve Native American cultural resources since the mission period in Amah Mutsun territory. The Amah Mutsun consult with Pinnacles on interpretation of California Indian history and culture, the significance of the endangered California condor, and the management and restoration of culturally significant species. Midpeninsula regional Open Space District (MROSD) manages over 60,000 acres in 26 open space preserves in San Mateo, Santa Cruz, and Santa Clara counties. These lands include Mt. Umunhum—the site of the Amah Mutsun creation story—plus over 150 plant species that are important in the Amah Mutsun ethnobotany. The Amah Mutsun Land Trust has been conducting research since 2014 to locate populations of culturally significant native plants in a selection of open space preserves and assess population phenology and resource condition. This information will be used to create a map of the most important cultural resource locations, provide information about best times to gather, and make recommendations for the management of these species. Managers at MROSD work with the AMLT to make sure that these sacred sites and resources are honored, protected, and accessible for Tribal relearning and ceremony. 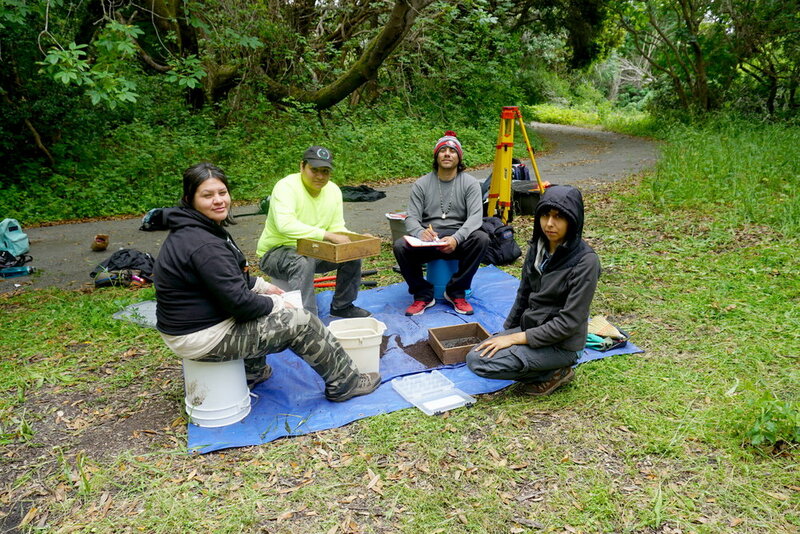 Every year Tribal members and AMLT research associates make trips to MROSD in multiple seasons to locate and monitor culturally significant plant species. In partnership with the Amah Mutsun Tribal Band and UC Berkeley, the Amah Mutsun Land Trust is transcribing and translating large portions of the 78,000 pages of field notes written by ethnographer John P. Harrington in the 1920s and ‘30s. Containing Mutsun language, ethnobotany, stories, Tribal history, and more, the notes represent a vast collection of conversations with Tribal elders, including culture-bearer Ascension Solorsano. In the 2015 project year alone, Mutsun Tribal members and UC Berkeley students transcribed approximately 9,000 pages of notes into digital format for use and interpretation by the Tribe. In 2017, this work culminated in production of the first print volume containing four issues of Mutsun Ways, a periodical designed to disseminate the results of Harrington Notes research to AMTB tribal members. For more information about any of the projects mentioned, or to request a list of all current and completed projects, please reach out to the AMLT team via email to info@amahmutsun.org. If you have interest in collaborating with AMLT on a research project that falls in line with the goals of AMLT and is within the Amah Mutsun tribal territory, please email your proposal to Sara French at sreid@amahmutsun.org.